Darrell Kaufman readily admits he has been “hooked on the wildness of Alaska since my first visit in 1979.” Peek at the photo gallery on his Web site and you can understand why. Scores of images show the professor of geology and environmental science (Northern Arizona University) and his students in gorgeous Alaskan wilderness, camping, hiking, boating—in fact, working. Kaufman has a long career of field research in Alaska. “After I graduated from college in 1982, I lived in Anchorage for three years,” he explained in a recent email, “and I worked two-month-long field seasons with the USGS on a large-scale mapping project across the Seward Peninsula. Kaufman and colleagues recently published results of a four-year National Science Foundation-funded study in the journal, Science, which summarized their collaborative work on arctic lake sediments. 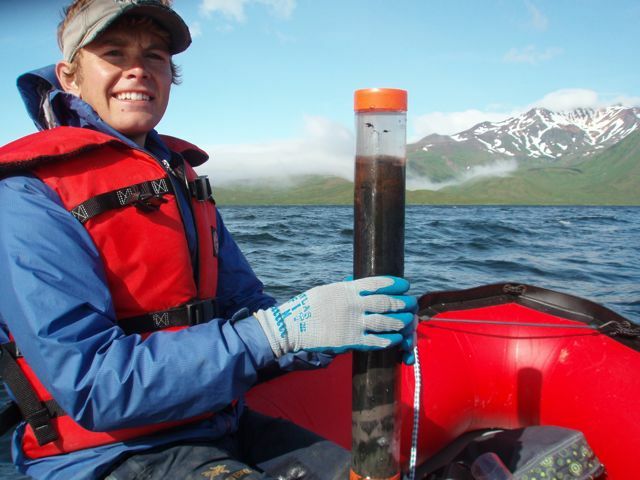 Kaufman, who studies lake sediments for clues about arctic climate, will begin another large project funded by the NSF next season by coring sediments from lakes across southern Alaska, from the Aleutian Islands to the Chugach Mountains. We recently asked him about his work. What is the importance of North American lakes in understanding climate change? Lakes are widely distributed across the Arctic and they contain a variety of evidence about past environmental and climate changes. What information do lake sediments preserve? For example, the primary producers in Arctic lakes are diatoms [microscopic algae], and the lake sediment preserves the remains of the diatoms that grow each year. We can relate the abundance of diatom remains to the warmth of the summer. Warmer summers are associated with longer open-water periods, which allow more diatoms to bloom. Changes in the abundance of diatoms that grew over the last 50 or 100 years and are preserved in the sediment at the lake bottom can be compared with temperatures from nearby weather stations. We can then apply this calibration down the sediment core to infer the changes in temperature that took place prior to thermometer-based records. How much time do Arctic lake sediments typically preserve? Most of the deeper lakes occupy basins scoured out during the last ice age, about 15,000 years ago. Some places in the Arctic were not covered by glacier ice and the deepest lakes contain sediment that extends even further back in time. Why is understanding the behavior of the Aleutian Low important to understanding climate change? It's a major feature of ocean-atmospheric circulation in the North Pacific region. We'd like to understand how it behaved over centuries or millennia as ocean-atmospheric circulation was forced to change as climate itself changed. Why is the medieval warm period important to your studies? Studying periods when temperatures were relatively warm can provide clues as to how the Arctic system behaves under warmer conditions. It now appears that the last few decades were warmer than anytime during at least the last 2000 years, including the medieval period. Will you talk a little about how you plan to compare and contrast records from glacially fed versus organic lakes? No two lakes are the same. Each one reflects the unique conditions of its watershed and limnology. Lakes that are fed by glaciers are turbid and inorganic; lowland lakes in vegetated landscapes receive less sediment and more nutrients to support abundant aquatic life. 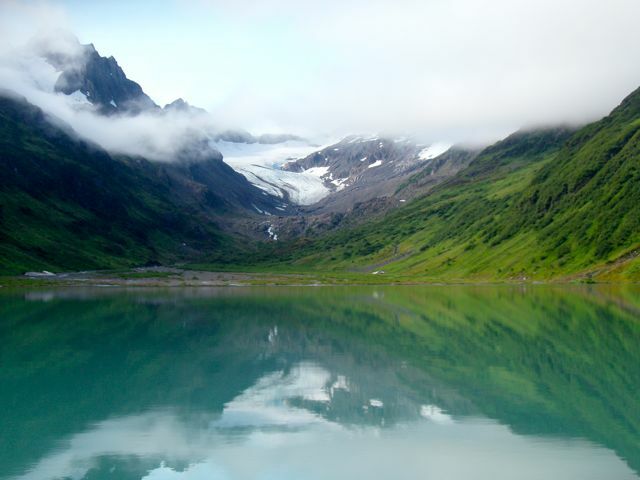 Sediment in glacier-fed lakes can often be interpreted in terms of changes in the melting of glaciers that feed the lake, which in turn reflect changes in winter precipitation and summer temperature. In contrast, the sediment in organic-rich lakes can often be interpreted in terms of environmental changes that control biological productivity, which in turn reflect temperature and other climate factors. By combining evidence from multiple lakes, we can develop a richer picture of past environmental and climate changes. How do you choose which lakes you will study? Accessibility, location, and suitability for a particular proxy type, among other factors. We typically core lakes in the summer when we can also survey the bathymetry and sample inflow streams, so the lakes need to be large enough to land a float plane. To capture the footprint of the Aleutian low-pressure system, our transect of study lakes extends from the central Aleutian islands in the west to the easternmost Chugach Range. How many lakes did you sample last summer and where are they? We recovered exploratory cores from three lakes on Adak Island, and a suite of new cores from lakes in the Bristol Bay area, and near Valdez. We also returned to our sediment and weather monitoring stations at three other lakes in the Ahklun Mountains. Will you summarize this summer's logistics? We charter our most-trusted pilots and their float planes to fly us and our coring gear to the lakes, then we set up camp by the lake and use inflatable boats and platforms to take the sediment cores. It takes four or five people to do the hard work coring sediment. This summer, we also hosted a PolarTREC teacher, who was a great help. What is a 'typical day in the field' for your group? Early rise; work all day; collapse in the sleeping bag -- repeat. Please briefly explain your methodology for acquiring lake sediment samples. We lower core tubes three to six meters long to the lake bottom — sometimes 50 meters deep — on a cable from a floating platform, and use a hammer on a rope to tap the tube into the mud, inch by inch. Then we hoist the tube from the lake bottom and hope that the mud stays in. It’s a good day when we get tubes filled with mud. How do you get your samples out of the field? We split the core tubes lengthwise and hope for dry weather so that any soupy mud dries slightly -- enough to stabilize. We then wrap each half with bundling film, which holds the mud tightly within the core tubes. The tubes are then shipped to our lab at Northern Arizona University where they are kept in cold storage and sampled for a variety of analyses. How do you process your samples back in the lab? The cores are analyzed for a variety of biological and physical properties. We typically sample the upper 100 years of sediment in two-milimeter-thick intervals to generate a detailed record to compare with historical records of climate from nearby meteorological stations. The rest of the core is typically sampled at one-centimeter intervals to analyze for the abundance of organic matter, including diatoms and pollen. Samples are distributed to collaborators who work on all types of biological materials that are well preserved in the lake sediment. Every lake that we have cored in Alaska contains multiple layers of volcanic ashes, and we are collaborating with the Alaska Volcano Observatory on studying these deposits. For glacier-fed lakes, it's the sedimentary layers themselves that are the focus of our analyses. Determining the age of the sediment down the core is critical, and we spend a lot of time isolating bits of vegetation for radiocarbon dating. Without good age control, it's difficult to relate the changes in the sediment to changes that are known from elsewhere. We want to learn more about how the ocean-atmospheric circulation of the North Pacific region responds to climate change. How do you expect your southern Alaska results will contribute to your upcoming study? Our results from lakes in southern Alaska will be integrated into a larger network of proxy climate records from around the Arctic. In particular, the results will help us to understand how the Arctic and North Pacific climate systems interact. What is the most challenging thing about working in the Arctic region? Accessing the field sites takes a lot of planning and a lot of time to just get there. We probably spend ten days either preparing or waiting out the weather for each day we have on task in the field. The weather is a huge factor in determining the success of our field work. We can't work on lakes when the wind blows. What is the most important thing you'd like for people to know about your work? Lakes provide an ideal focus for multi-disciplinary research, and the Arctic/Subarctic has loads of lakes, most of which have not yet been severely altered by human activities. Understanding how to interpret past climate changes from the biological and physical properties of lake sediment is not easy, but when a team of scientists work to fit the pieces together, it can be extremely rewarding.